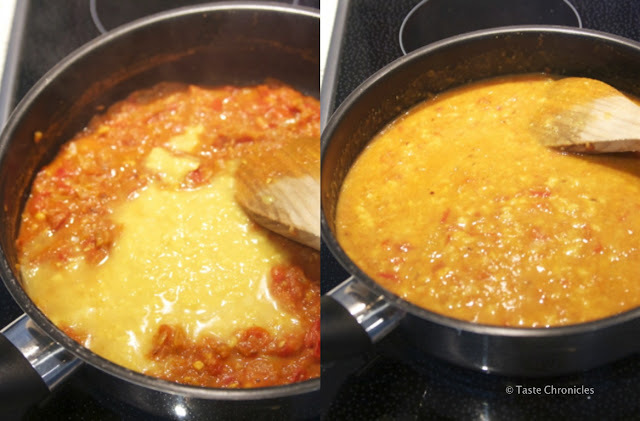 The dal to water ratio will vary depending on your preference and if you have pre soaked the lentils. Lentils soak a LOT of water. 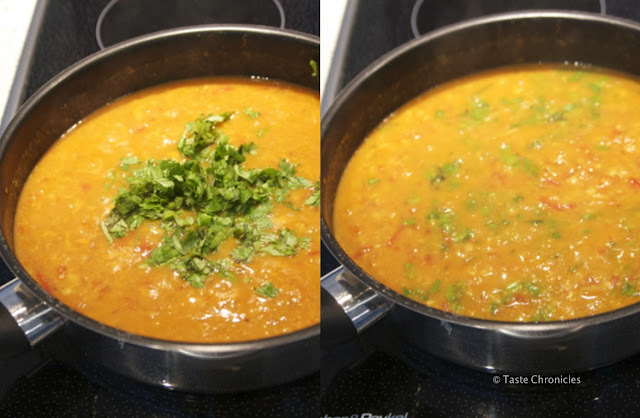 I don't pre soak the lentils and I like the dal a bit soupy. 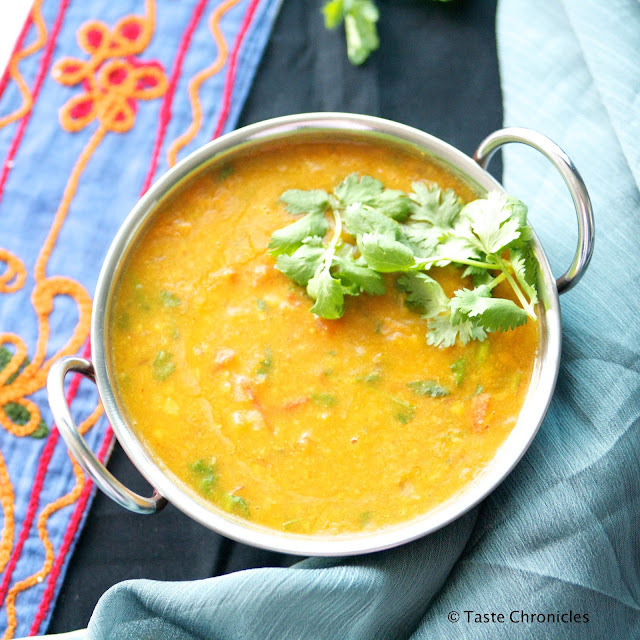 For 1.5 cups of dal, I used 8 cups of water. A pressure cooker is your best friend for cooking the dal. If you don't have one, pre soaking the lentils is highly recommended. Then simmer it on the stovetop (about 30 -45 minutes) with 1:3 ratio of dal to water. 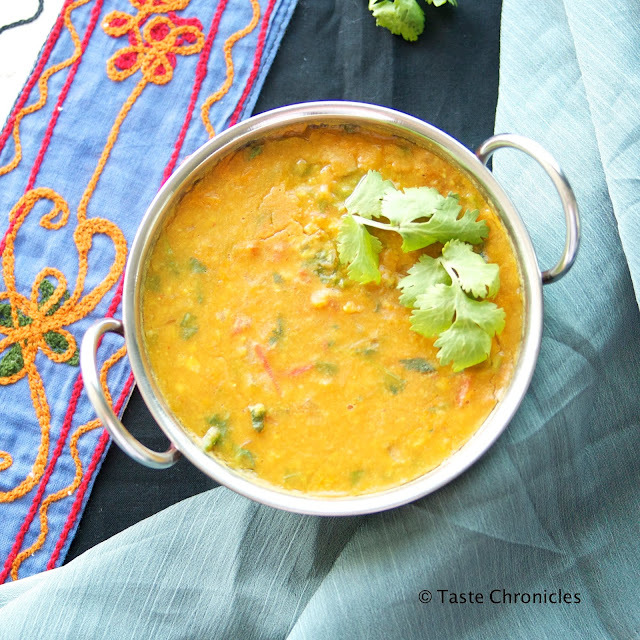 Start by cooking the dal. 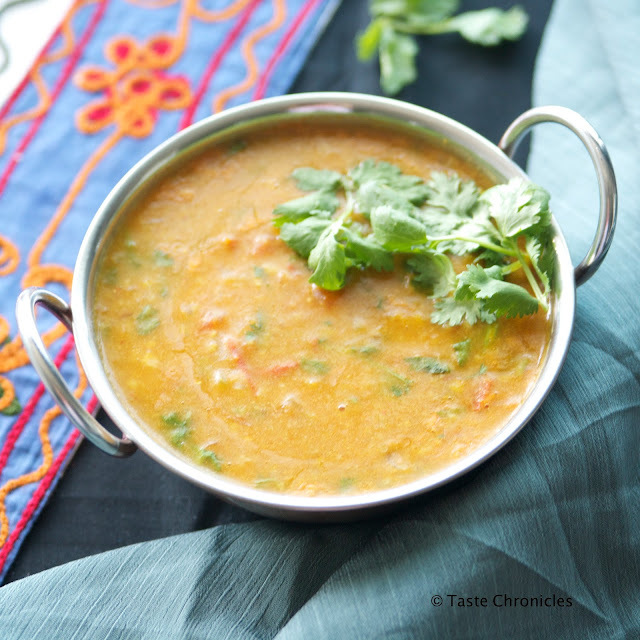 ** If using cooked dal, use 3 cups of dal in the recipe. I froze half the dal I cooked. 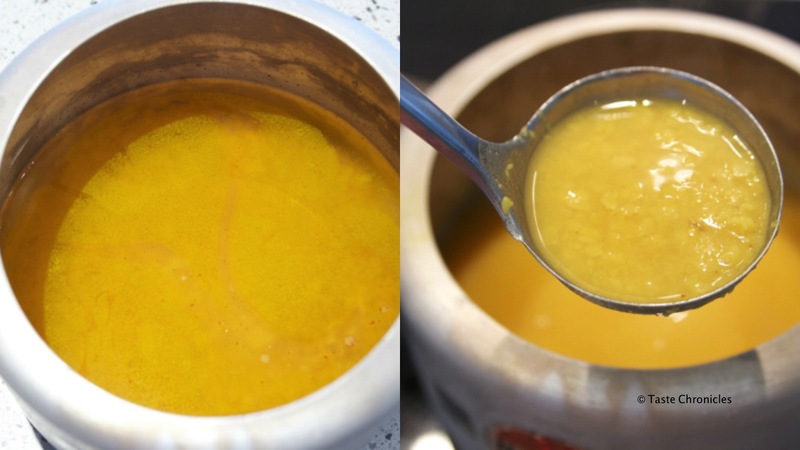 Add lentils, water, half a teaspoon of turmeric, half a teaspoon of Kashmiri red chili powder, 1/4 teaspoon of Hing and salt. Cooking time will depend on the pressure cooker too! Most Indian recipes will measure time in "whistles". That is how many times the pressure cooker lets off steam. 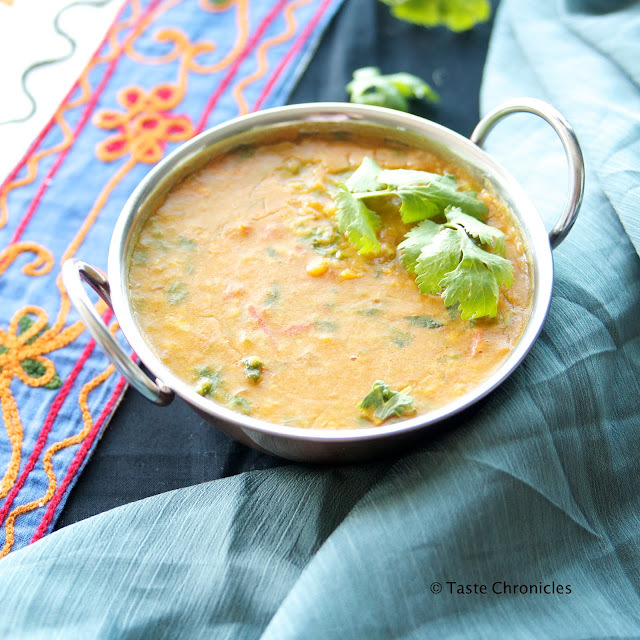 I wait for about 3 whistles for the dal before I turn the heat off. This takes up to 15 -20 minutes. The lentils are cooked and soft but can still see the form of the grains so it isn't completely mashed. You might have to squint a but to see that in the photo below!! Prep the ingredients for the dal fry. 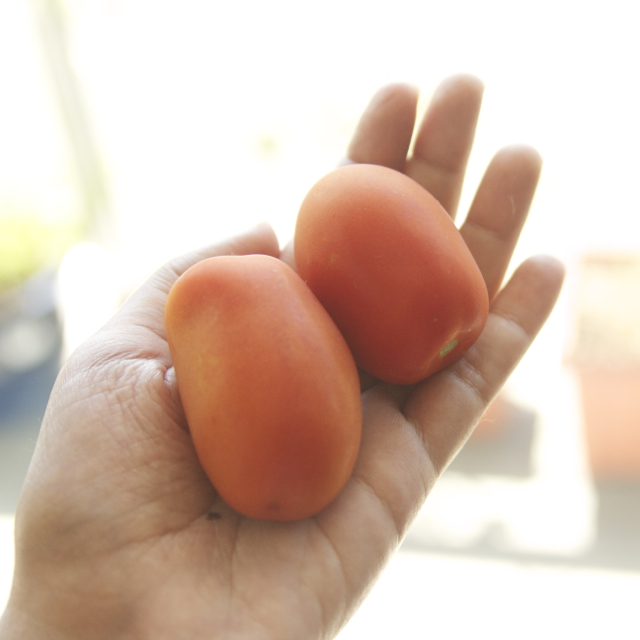 Before we start prepping, can I please show off these gorgeous home grown tomatoes? Aren't they beautiful? I unfortunately only had two, so this didn't quite suffice for the recipe. So I added two large ones bought from the store. Also pictured in this photo is the until-recently-broken hand! 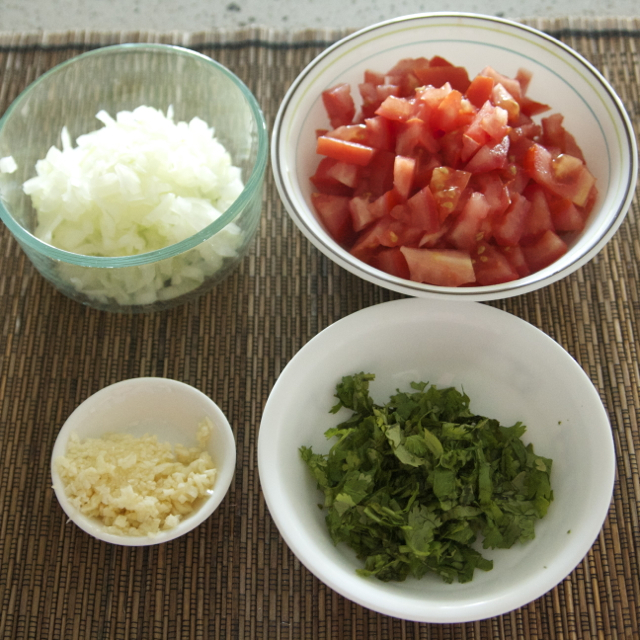 Chop the onions, tomatoes and cilantro. 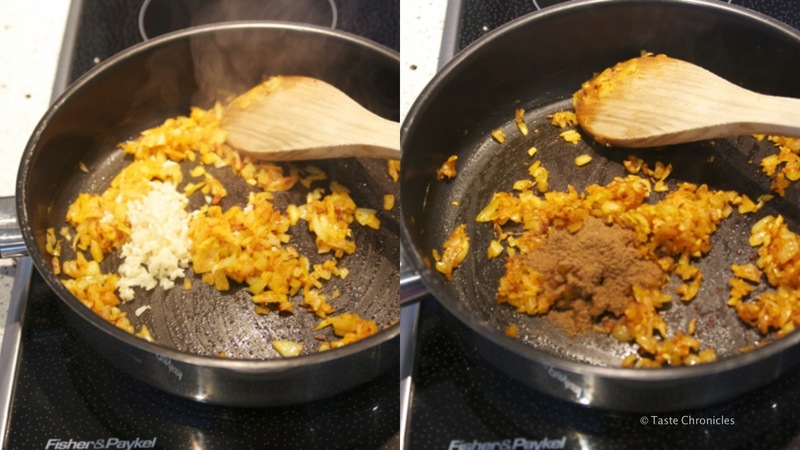 Mince the garlic cloves. Heat 2 Tablespoons of oil and add cumin seeds still they start to sizzle. Toss in the onions and cook for a couple of minutes and add the rest of the turmeric and Kashmiri red chili powder - half a teaspoon each. 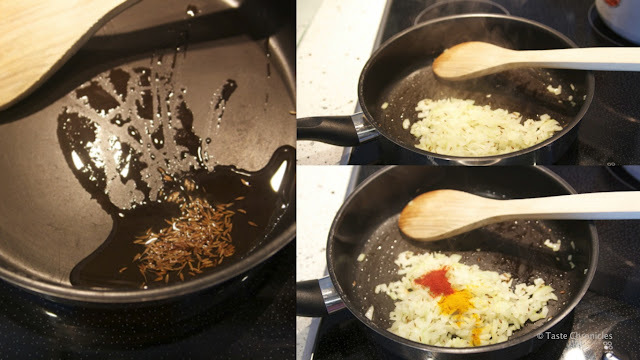 Cook for another minute and toss in the minced garlic. Stir and cook and add the cumin powder. Cook till fragrant - about two more minutes. The onions should be cooked by now. Add the tomatoes and let it cook down to a pulp, about 5-7 minutes. Add a bit of salt to help it along if needed. 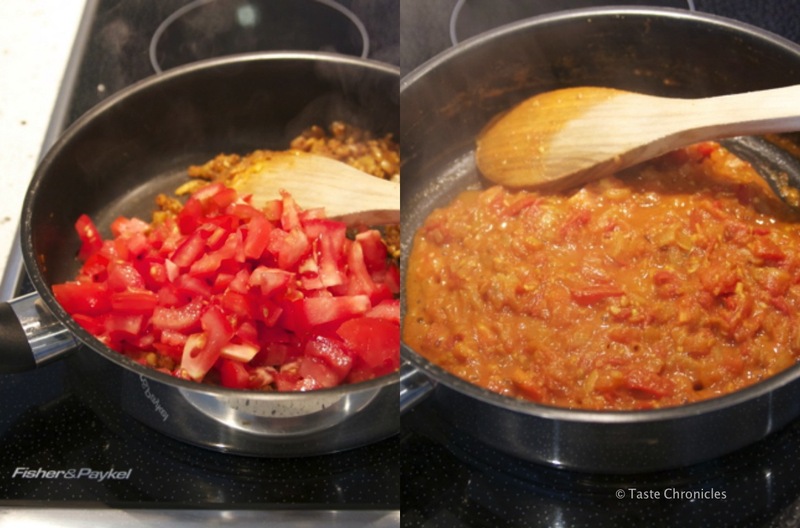 Start adding the dal when the tomatoes are completely cooked - 3 cups! Combine and bring to a boil. Add 1/2 teaspoon of sugar. This balances all the flavors.